Ecuador’s President Rafael Correa has threatened to evict the indigenous organisation CONAIE from their headquarters, on political grounds. An open letter asking Correa to retract his decision has been signed by hundreds of intellectuals and activists across the world. On December 11 the Confederation of Indigenous Nationalities of Ecuador, CONAIE, received a notice asking them to leave the offices that serve as their headquarters in Quito. They had been given these premises on loan in 1991 by what was then Ministry of Social Welfare. 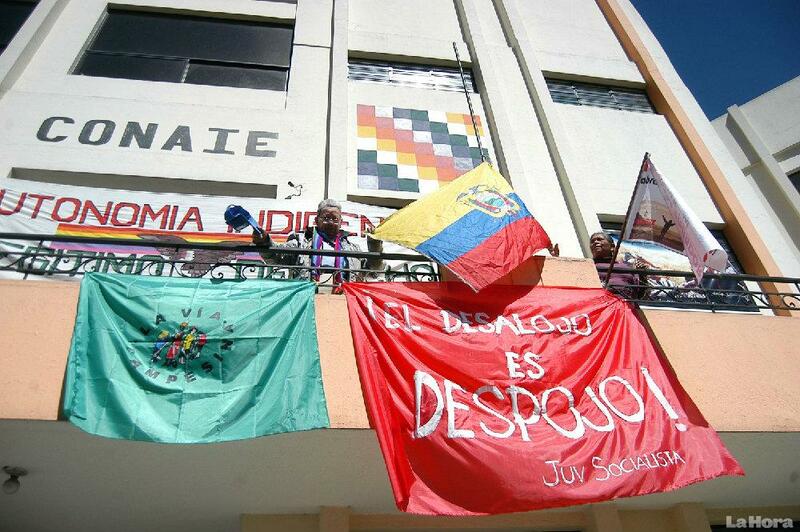 The headquarters of the CONAIE are a symbol of indigenous resistance, and also of popular resistance in Ecuador. Actions organised here include the 1990 indigenous uprising, the struggles for land and the recognition of indigenous territories in 1992 and the defense of the collective control of water. The proposal of the plurinational state was also conceived in this place. CONAIE has furthermore had a central role in popular mobilisations in Quito, such as during the struggle against the FTAA (Free Trade Agreement of the Americas) and then the Free Trade Agreement with the United States, against the shutdown of banks (“feriado bancario“) which destroyed the Ecuadorian economy in 2000, against the privatisation wave of the neoliberal era, and in the current defense of indigenous territories from oil and mining development. Reactions to this decision have recently come from intellectuals and activists. Portuguese sociologist Boaventura de Sousa Santos asked Correa, “why are we wasting so unreasonably a unique opportunity to transform Ecuador into a more just, intercultural and plurinational society?” Uruguayan writer Raúl Zibechi has defined the recent attitude of the Ecuadorian president towards environmental and indigenous movements as “a mix of repression and harassment”. 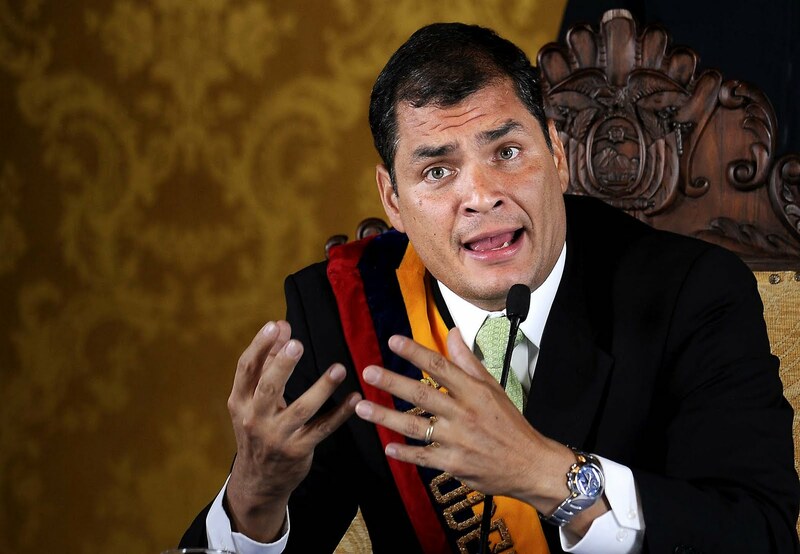 An open letter to President Rafael Correa (see below), circulated in the last weeks of December 2014, has already been signed by over 450 intellectuals and activists across the world. We invite you to sign it by sending an email to Alejandra Santillana (alesantillana [at] hotmail.com) or Paul Ospina (halcon6719 [at] yahoo.es), including your full name, country and institutional or organisational affiliation (optional). Letters of support to CONAIE will be also appreciated. You can send them to: info [at] conaie.org. The signatories of this letter have been surprised by the news that the Government of Ecuador decided to revoke the loan agreement established in 1991 for the use of the building of the Confederation of Indigenous Nationalities of Ecuador, CONAIE. In our view it is clear that the reasons given (the use of the premises for the rehabilitation of young people with addiction problems) are not satisfactory: a State like Ecuador has many places in better condition and location for such tasks. The measure is unjustified. More than an act of retaliation this is disrespectful to the memory and history of an organisation to which Ecuador owes democratic struggles and extraordinarily profound and positive social transformation. More than an administrative act without political intent, it seems to be a very disturbing evidence of sectarianism. More than an isolated act, it looks like the latest incident in a series of episodes of intolerance towards criticism from different social movements of the most varied kind. In our opinion, the government does not need such outbursts and loses moral authority by using this logic of assertion of force and intimidation. It is not too late to rectify. It would be a courageous act of political intelligence and generosity on your part if you gave positive proof of recognition of the historic emancipatory deeds of one of the largest organisations of indigenous peoples and nationalities of Ecuador. The peoples of our America and the progressive forces of the world do not forget this glorious history. You should not ignore it either.